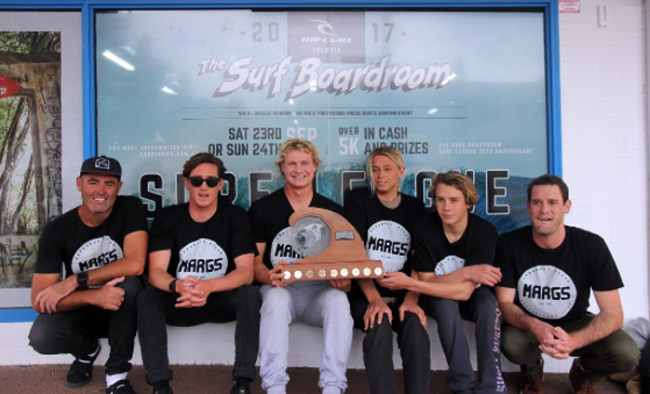 " MARGARET RIVER BOARDRIDERS CLUB CLAIM VICTORY AT THE�2017 SURF BOARDROOM SURF LEAGUE "
The Margaret River Boardriders Club claimed victory yesterday at�Western�Australia's longest running and�most prestigious inter-club�surfing event, The�Surf Boardroom Surf League presented by Rip Curl. First run back in 1986, Surf League's�31st�instalment�will be remembered as�one�of the biggest and�most hotly�contested battles in recent years, as�a total of nine metropolitan and regional boardriding clubs�went head-to-head in punchy windswept peaks at Scarborough Beach. � In a sign that club surfing is�alive and kicking in Western Australia�at the moment, boardriders�clubs from�Geraldton, Two Rocks, Trigg Point, Scarborough,�Contacio,�City Beach,�Yallingup, Cowarmaup Bay�& Margaret River converged�with six of their best surfers�in tow�(4x Opens, 1x O/30 Master & 1x U/18 Junior), all of them out�to etch their club's name onto one of WA's most prized perpetual trophies. � Despite some tough and testing ocean conditions, surfers put their best foot forward for their respective clubs, with the�high�performance action�in the water�creating�an�exciting�on-beach atmosphere. With over $5k in cash and prizes up for grabs, a�talented field of competitors made the most of the conditions�on offer, whilst�providing�a viewing�spectacular for the strong on-beach crowd who had pilled in�to support their favourite club. Preliminary heats saw the Cow Bay Boardriders dominate in their first-ever�Surf League event.�Filled with talented youngsters,�Cow Bay joined Geraldton,�Scarborough and�Contacio in moving through to the semi final round. � Semi final one saw Margaret River, City Beach, Geraldton and�Contacio�surf off�for their spot in�the�blu-ribbon final.�While Semi final two saw�Yallingup, Trigg Point, Cow Bay and�Scarborough do battle. After two�enthralling and highly entertaining 90-minute semi finals�that displayed the�amazing�depth of�local and regional boardriding club talent, it was�Margaret River, Yallingup, Geraldton and Cow Bay who qualified for the Surf League grand final. The 2017 Surf Boardroom Surf League�created some new history, with no�metropolitan clubs represented in the final. For the first time�it would be�an all regional club match up in the final. The Margaret River Boardriders,�started strongly�and maintained their consistency throughout the final, posting�a combined team total of 85.89, to secure�back-to-back Surf League victories.�Margaret River's�consistency and�ability under pressure was hard to match, with all six surfers keeping their�combined total moving up after each surfer�exchange. Yallingup (73.65) had to settle for a second place finish head of Geraldton�(70.93)�in third and Cow Bay�(69.34)�in fourth. The Margaret River team�included; 2017�Open Men's State Champion Jerome Forrest, 2017 Under-18 Junior State Champion�Jack Haslau, as well as Jethro Hedstrom, Andrew Sheridan, Jed Mattinson and Ben Spence. � "It's been an unbelievable day, I couldn't be happier with how they boys performed,"�said Margaret River's Captain Andrew Sheridan.�"I think I've competed in almost every one of these events and they just keep getting better.�The waves have been tricky, but at least we had some solid swell and we're stoked to come away with the win. A big�thanks The Surf Boardroom and all the clubs for a sick�day." � Margaret River's Ben Spence�was awarded the prestigious Perry Hatchett Medal, an honour reserved for the best individual surfer in the�final. Spence's powerful and�committed on-rail�surfing�saw him notch up an all important 13.00 (from a possible 20),�which helped�guaranteed victory for his club. � "Perry Hatchett is a legend and I'm stoked to help Margs get the win," said Spence. "I've spent a lot of time with Perry filming over the past year and he'll be stoked to hear I won his award." The Surf League forms an integral part of the West�Australian surfing scene, with�2017�marking�the 25th�consecutive year that�local surf retailer,�The�Surf Boardroom have been supporting�this iconic and much loved event. "We've been involved with�the Surf League since 1992 and�to be a part of an event that encourages grass roots�WA boardriding clubs is something pretty special,"�said The Surf Boardroom owner Geoff�Counsel.�"I'd like to congratulate Margaret River on their�great win, and all nine�of the clubs�who competed today, as well as our�industry partners who have backed our vision for�the Surf League over the years." Surfing Western Australia's Event Manager Justin Majeks was elated with the Surf League's ongoing�success�and was excited to see the depth of talent on offer from nine�of the states best�boardriding clubs. "It's clear that events such as this are a big deal for WA clubs, so to�see the level�of�enthusiasm, excitement and high standard of�surfing�despite some testing conditions was really great,"�said Majeks.�"We look forward to seeing more and more clubs competing in the Surf League in the future." Creatures Ripper Award (Highest�Individual�Score)�> Duke Nagtzaam (Yallingup) 9.33�ride.